Your pet’s care is our highest responsibility. We dedicate ourselves to helping your pet become comfortable with our staff, and ensuring you get the assistance and information you need to maintain your pet’s well-being. 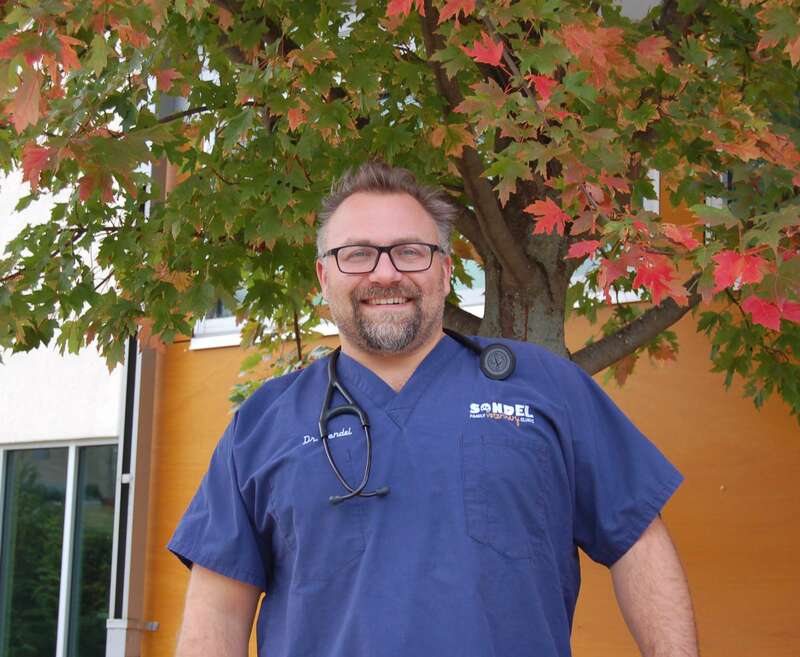 Born and raised in Madison, Dr. Sondel is a 2003 graduate of the University of Wisconsin School of Veterinary Medicine. While he takes great pride in the care he provides his clients, his favorite part about being a vet is the relationship he has developed with his clients over the years. Dr. Sondel’s veterinary clinic has received Best of Madison awards for many years. His reproductive expertise draws owners from across the Midwest, and his anesthesia-free orthopedic evaluations, recognized by the Orthopedic Foundation of Animals, attract breeders from around the country. Dr. Sondel lives with his wife, Emilie, children, Jordan and Evan, mastiff, Bob and french bulldog, Tuna. In his spare time he enjoys spending time with his family, biking, coaching hockey and enjoying the great outdoors. 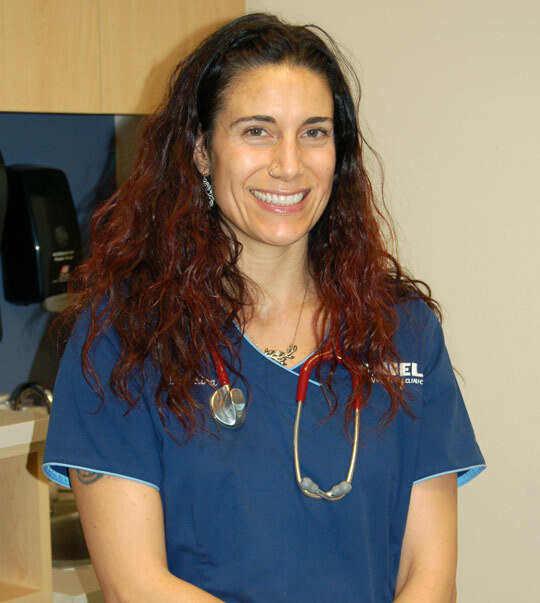 Dr. Kira graduated from the the University of Wisconsin School of Veterinary Medicine in 2003, with Dr. Sondel. She practiced as a small animal veterinarian in Seattle for 10 years before moving back to WI and joining SFVC in 2015. Dr. Kira is especially interested in the human-animal bond and the role of the veterinarian in helping to strengthen that bond. She also has interests in internal medicine and surgery. In addition to her three human children, Dr. Kira has two furry children, both rescued as adults. Jelly is a redbone coonhound mix and Peanut Butter is a Siamese mix. Both animals are pure-bred love. In her free time, Dr. Kira enjoys spending time with family and friends, hiking at Devil's Lake with Jelly, baking fancy cakes and reading. Dr. Elana Frankenthal was born and raised in Milwaukee, WI and moved to Denver, CO to pursue her undergraduate and Master of Business Administration (MBA) degrees. During her MBA program, she realized life was too short to live with regrets and decided it was worth pursuing her lifelong dream of becoming a veterinarian. 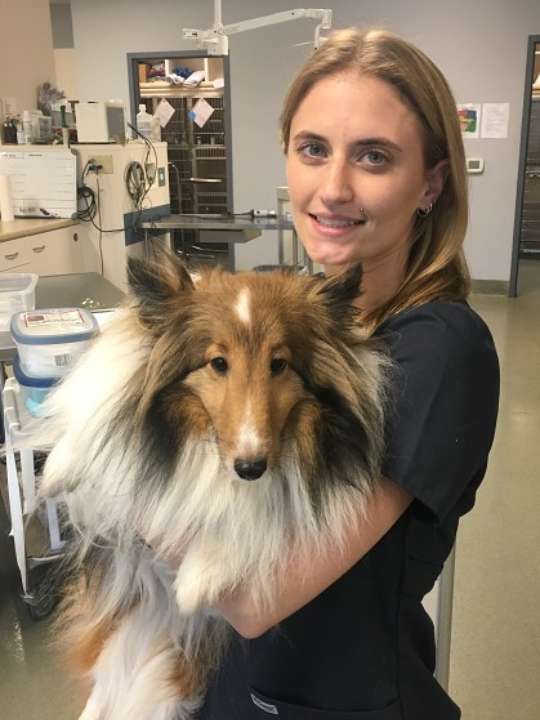 Shortly after, she landed back in Wisconsin and graduated from the University of Wisconsin School of Veterinary Medicine in 2017 with high honors. 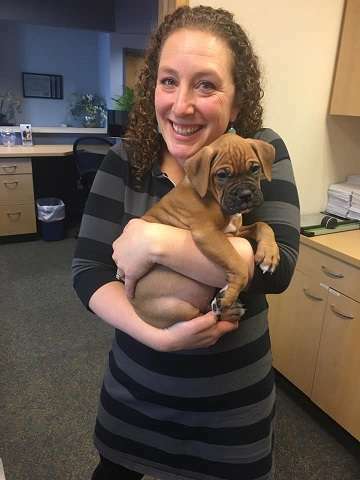 Integrative medicine has always been a big part of Dr. Frankenthal’s life, so it was fitting that she decided to pursue veterinary acupuncture certification through the Chi Institute in 2016. She also completed a laser therapy course on the application of low-level laser and LED therapy. Dr. Frankenthal has spent multiple summers interning at SFVC and has loved getting to know the clients (and patients!). Dr. Frankenthal lives with her husband Max and their new baby daughter, Sydney. Their furry companions include two dogs, Sawyer (English springer spaniel) and Raja (mixed breed), and their cat Aspen. 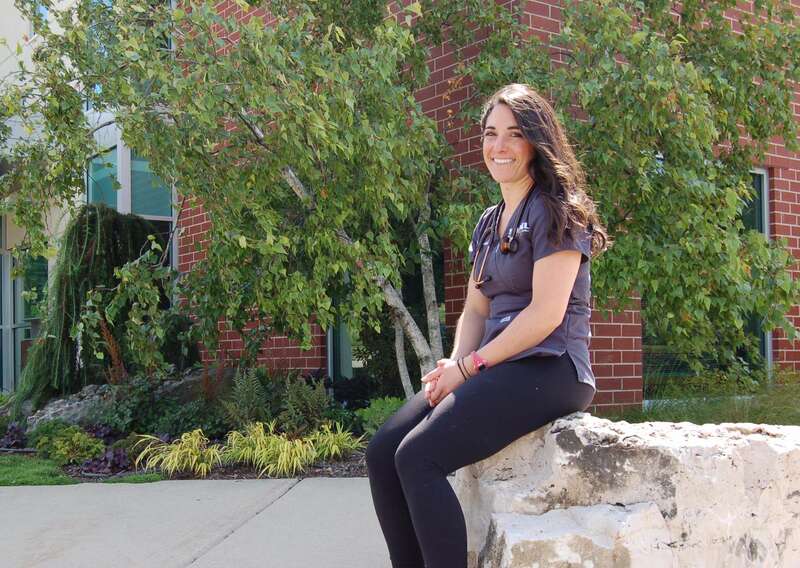 In her spare time, she enjoys spending time outside (hiking, boating, swimming), Pure Barre, and cooking. 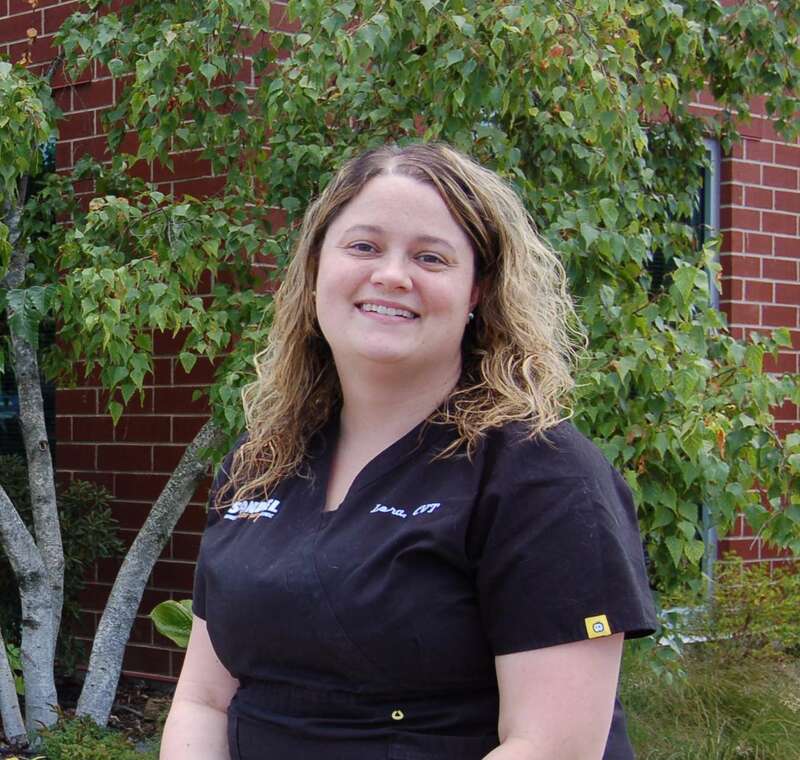 Jen has been in the veterinary industry since 2004 and has been with Sondel Family Veterinary Clinic since the day we opened. She finds it humbling and honorable to be clinic manager of a 6-time Best Of Madison award winning team! 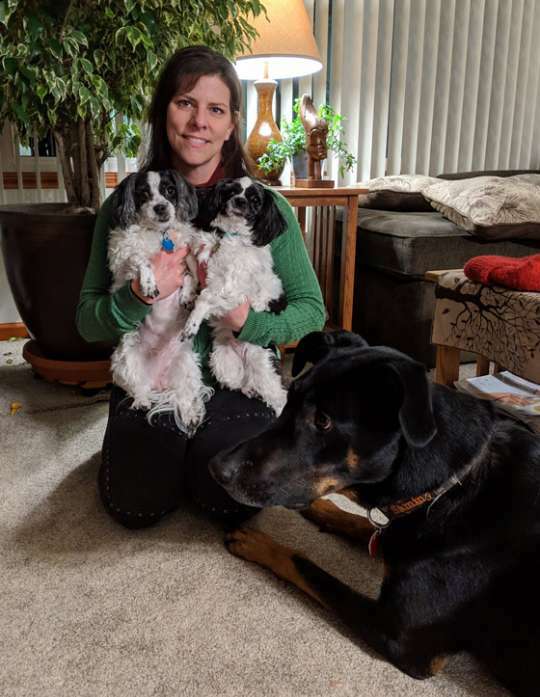 Jen received her Veterinary Assistant Degree from Penn Foster in 2011, and has enjoyed many business courses and continued education opportunities along her years in the industry. To her, the most rewarding part of the job is the connection she has built with our clients-they are like family! In her free time, Jen enjoys singing, going to the movies, riding and being around horses, pontooning, seeing live music, mindfulness practice, eating sushi, being near water of any kind, dancing and Badger hockey games. She lives in Mount Horeb with her fun little pet family. Brian received his certified veterinary technician degree from MATC in 2005. 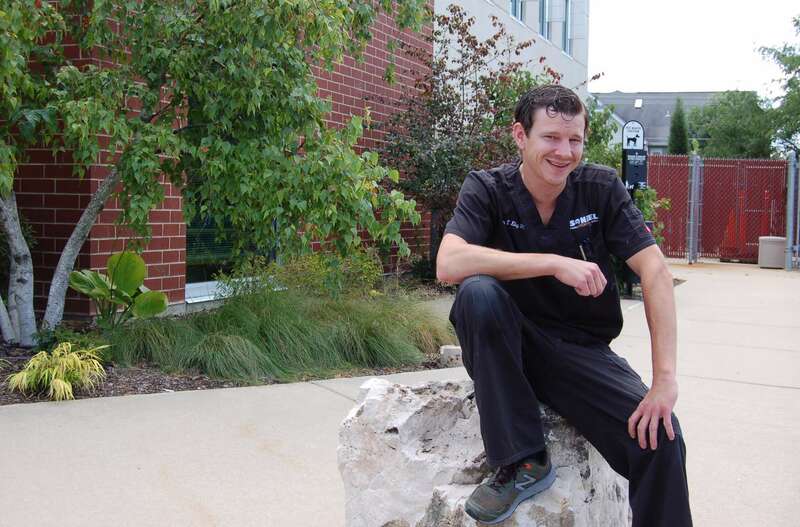 He has 5 years of emergency experience, 2 years of CAT scan and ultrasound experience, multiple years of working with a laparoscopic surgeon and has volunteered in the Milwaukee zoo in surgeries on a tiger and a lion. He also has additional ultrasound training to perform abdominal and echocardiograms as of December of 2015. Brian welcomed his son, Jameson, in January of 2009 and daughter, Lyla, in November of 2012. Other members of his family include his dog, Hazel, and his cat, Captain Crunch. Aside from keeping up with everyone at home, Brian also enjoys fishing, hunting, Frisbee golf (frolf), ATVs, remodeling his house and working on his cars. Lora has been a Certified Veterinary Technician for 13 years. She has a menagerie of pets including Dalilah Marie, a Pit Bull mix, Sampson, an English Mastiff, as well as Olive and Philip and Brim, three adorable kitty cats! Lora likes traveling, hiking, knitting and eating her husband's “amazing cooking” when she's away from the clinic. She enjoys any and all snuggling or affection opportunities with patients, as well as animal dental care and helping to make sure owner's understand how to best care for their pets! Emilie joined our team “officially” in 2019! This is her first time gaining veterinary experience hands-on and we welcome her! Emilie has her master's degree in Counseling Psychology. In her free time, she enjoys being outdoors, swimming with her kids, traveling, playing charades, dancing and snuggling with her dogs. 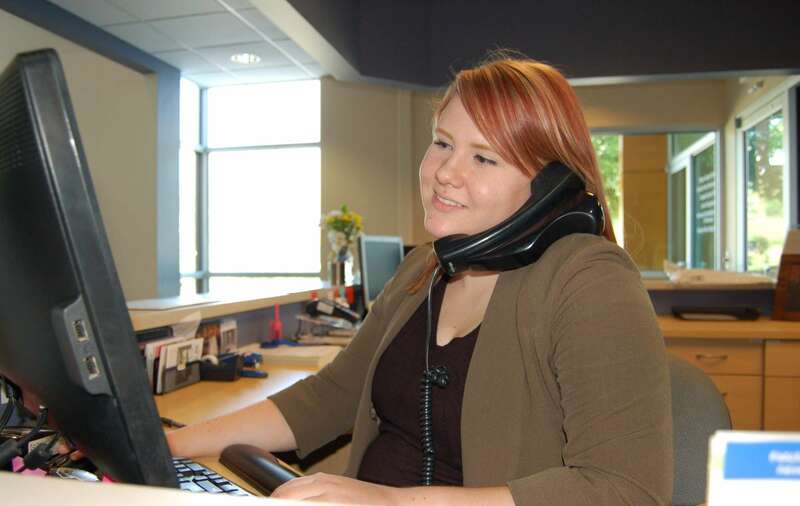 Sarah is a Certified Veterinary Technician who graduated from Minnesota School of Business - Plymouth in 2010. 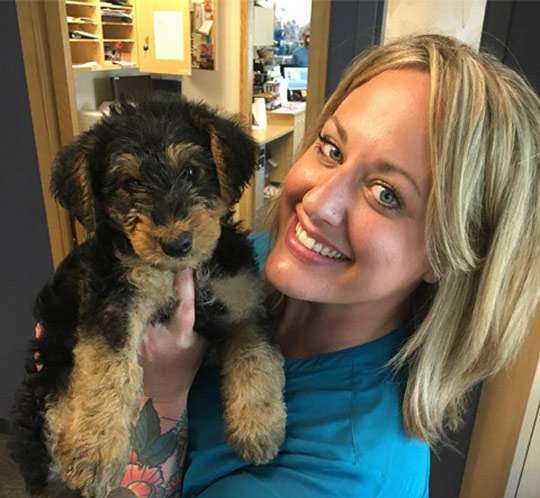 She worked for a small veterinary clinic in Minnesota before moving to Madison in 2013, where she laid roots with her family. She started volunteering shortly after at Dane County Humane Society in Medical Services. Sarah enjoys her work as a CVT here at Sondel Family Veterinary Clinic, helping all of our patients feel better! Sarah's pet family includes two grey short hair cats, Luke and Logan, whom she adopted from the humane society in Minnesota. They keep her very busy along with her young daughter Kailey. She enjoys spending time exploring new parks around Madison and reading. Gina is the newest member of our team, joining in February of 2019! Gina graduated from Globe University's veterinary technician program in 2016. She is enjoying “learning the ropes” around SFVC and has taken a particular interest in reproductive medicine. In Gina's personal time, she enjoys a wide variety of things, including aerial yoga, cooking from scratch, riding horses whenever possible, traveling to mountainous areas (and hiking said mountains! ), reading and singing. She lives with her husband in Madison and they share their home with two Shih Tzu mixes, Biscuit and Smalley, as well as a Doberman/Shepherd mix named Sammy and a cornsnake named Fluffy! Sara has 4 years of experience in the doggie daycare industry and is excited to expand her knowledge into the world of veterinary medicine. She lives in Madison with her cat Malik, and in her free time she enjoys baking, being outdoors, live music, and spending time with friends and family. Sara loves getting to know patients and finds nothing more rewarding than the look on a pet's face when they're happy to see you!